The Polynesian currency was created in December 1945. It has become a symbol of Polynesian independence. 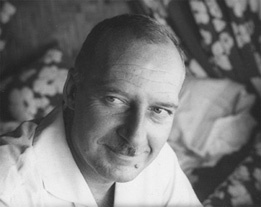 The first notes were issued by the Banque d’Indochine and circulated in 1945. 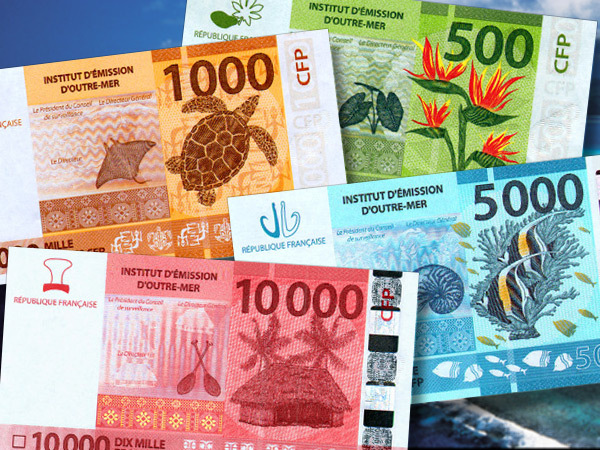 Then in 1967, the IEOM (Institut d’Emission d’Outre-Mer) took over the responsibility of putting the money in circulation. 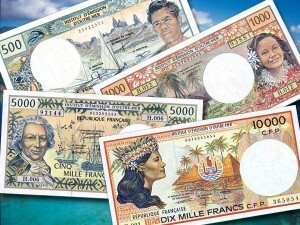 The Polynesian currency is called the Pacific franc as well as the “franc CFP”. This could have various meanings : « franc des Colonies françaises du Pacifique », « Communauté financière du Pacifique » or « Change Franc Pacifique ». From a banking point of view, the Polynesian currency symbol is « XPF ». It has a fixed rate relative to the euro : 100 F CFP = 0,83 €. 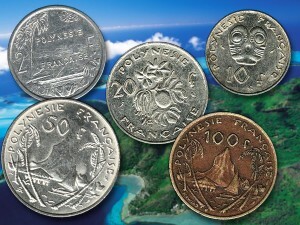 The Polynesian currency is also used in New Caledonia and Wallis and Futuna. As a result, one side of the note face represents Polynesian symbols and the other side presents a back illustrating New Caledonia. The local currency offers 4 different banknotes (500, 1000, 5000 and 10 000 francs bills). Coins are in the set denominations (1, 2 ,5 ,10 ,20 ,50 and 100 francs). There are, however, two different series of coins independently distributed in French Polynesia and New Caledonia. They also symbolize the real cultural heritage of these Pacific islands. Polynesian notes are colorful. Each one presents various patterns referring to the flora, fauna, the people and the history of French Polynesia. A major part of banknotes has been illustrated thanks to Adolphe Sylvain’s photographs. This photographer visited the Polynesian islands awhile back and found superb images. From a legal viewpoint, the signatures of three administrative figures are appended on local bills: chairman of the supervisory board, executive director and director of the IEOM. In a few months, the Polynesian economy will face a real change. Indeed, the IEOM has decided to replace the whole range of Polynesian bills. This replacement should be effective from January 20th, 2014. These new notes still remain as colorful (green, orange, blue and red). They will adopt the Euro bills size offering a lesser risk of counterfeit notes. Special design features also enable visually impaired users to distinguish the banknotes easily through tactile recognition. These new bills will wear iconic themes : flora (Birds of Paradise), terrestrial and aquatic fauna (birds, turtles, rays), the local architecture (bungalows) or traditional culture. These precious notes have been illustrated by the Caledonian artist Sophie Eugene. She had to face a main difficulty: evoke three different cultural identities on each banknote. It is estimated that 14 million bills are to be turned over. Moreover, a new denomination of note the « 20.000 Fcfp » banknote will be introduced in 2014. The new notes are not yet in the Polynesians’ wallets but are already causing strong responses. Indeed, those nostalgic about the old Polynesia see this change as part of their history about to disappear.